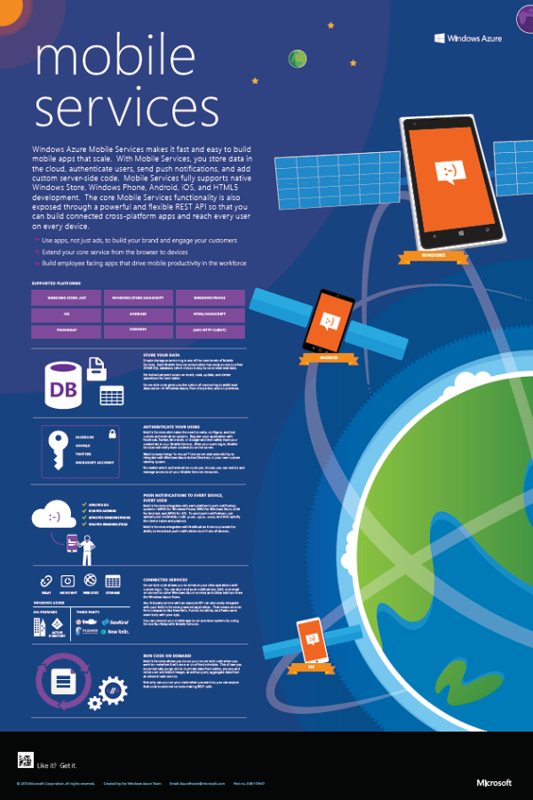 This topic supports the Microsoft Azure Mobile Services infographic shown below. You can download a high-resolution version of this poster from the download center: Mobile Services infographic. This topic includes content from the poster along with links to topics that provide you with more information. Mobile Services makes it fast and easy to build mobile apps that scale. With Mobile Services, you store data in the cloud, authenticate users, send push notifications, and add custom server-side code. Mobile Services fully supports native Windows Store, Windows Phone, Android, iOS, and HTML5 development. The core Mobile Services functionality is also exposed through a powerful and flexible REST API so that you can build connected cross-platform apps and reach every user on every device. For more information about the core scenarios supported by Mobile Services, see the Mobile Solutions page on the Azure web site. For general information about Mobile Services, see the Mobile Services developer center. REST APIs enable you to access Mobile Services resources from in any client that can send and receive HTTP messages. Simple storage provisioning is one of the core tenets of Mobile Services. Each Mobile Services subscription has ready access to a free 20 MB Microsoft Azure SQL Database, which makes it easy to store relational data. For more information, see Work with data. Set individual permissions on insert, read, update, and delete operations for each table. For more information, see Permissions. Server-side code gives you the option of connecting to additional data stores—in Azure, from 3rd parties, and on-premises. For more information, see Work with server scripts in Mobile Services. Mobile Services eliminates the need to write, configure, and test custom authentication systems. Register your application with Facebook, Twitter, Microsoft, or Google and then safely store your credentials in your Mobile Service. After your users log in, Mobile Services will verify their credentials on the server. For more information, see Get started with authentication (Windows Store / Windows Phone / iOS / Android / HTML). Want to keep things “in-house”? Use server-side extensibility to integrate with Azure Active Directory or your own custom identity system. For more information, see this post on generating custom authentication tokens. No matter which authentication route you choose, you can restrict and manage access to all your Mobile Services resources. For more information, see Use scripts to authorize users (Windows Store / Windows Phone / iOS / Android / HTML). Mobile Services integrates with each platform’s push notification systems—MPNS for Windows Phone, WNS for Windows Store, GCM for Android, and APNS for iOS. To send push notifications, just upload your credentials, code push.apns.send, and then specify the device token and payload. For more information, see Get started with push notifications (Windows Store / Windows Phone / iOS / Android). Mobile Services integrates with Notification Hubs to provide the ability to broadcast push notifications to millions of devices. For more information, see Azure Service Bus Notification Hubs. Server-side code allows you to enhance your data operations with custom logic. You can also send push notifications, SMS, and email or connect to other Azure services and utilize add-ons from the Azure Store. For more information, see Work with server scripts in Mobile Services. Any 3rd party service with an exposed API can also easily integrate with your Mobile Services powered application. That means services from companies like New Relic, Pusher, SendGrid, and Twilio work seamlessly with your app. For more information, see Send email from Mobile Services with SendGrid and Build Real-time Apps with Mobile Services and Pusher. You can connect your mobile app to on-premises systems by using Service Bus Relay with Mobile Services. For more information, see How to integrate a Mobile Service with a REST Service Bus Relay Service. Not only can you run your code when you want to, you can expose that code to external services making REST calls. For more information, see Custom API.